Solving the Paleo Equation goes FAR beyond the benefits of eating a Paleo diet. Dr. Garrett Smith and Matt Stone cover everything from repairing your damaged metabolism to protecting yourself from harmful radiation in everyday life. If you are looking for a comprehensive guide on living a life of good health, this is the book for you. The book is nicely divided into sections of Stress, Nutrition, Exercise and Sleep/Recovery. Matt Stone and Dr. Smith have their own experiences outlined in neat boxes that are helpful and engaging. You may be surprised at some of the information given on each topic because it does not go along with the mainstream hype of fads and quick fixes. This book gives a solid foundation for real health and well-being and gives great examples and references to back up the advice. The section on exercise changed the way I think about 'working out'. I am looking forward to moving more in ways that I enjoy rather than straining and overtaxing my body. If you find yourself pushing your body so far that you are exhausted, you should definitely check out this section. Dr. Smith and Matt Stone give great solutions to the common problem of overdoing physical activity. If I had one criticism, it would be that there is a little too much over-analyzing in the Fats section. Paleo followers tend to know that fats are essential and know how to choose the right kinds. In my opinion, getting into which fats have more arachidonic acid and linoleic acid is not necessary if you stress the importance of quality meat, eggs, dairy and fats from grass-fed, free-range, foraged animals. I highly recommend this book for those looking to improve their overall health. 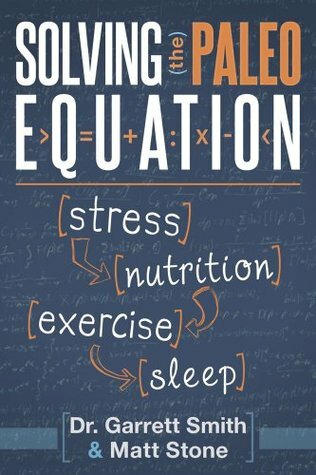 I received an advance copy of Solving the Paleo Equation but was not otherwise compensated for my review. Sign into Goodreads to see if any of your friends have read Solving the paleo Equation.